Feast on this delicious Spanish Tapa! Note: This is a very typical tapa in Sevilla, Spain! It is delicious. Crispy on the outside and oozing with goodness on the inside! If your husband is allergic to eggs like mine is, you can substitute the 2 eggs for 4 tbsp water whisked with 4 tbsp cornstarch. It works fine but changes the golden color of the finished product a bit! Melt butter in a large skillet over medium heat. Saute onions until transparent, 5 minutes (don't let them brown). Stir in flour and cook another minute, until combined. Whisk in milk. Cook over medium heat, stirring frequently until the sauce thickens, about 5 minutes. Season with nutmeg, salt and pepper. Stir in ham bits. Remove from heat and stir in gruyere. Transfer mixture to a shallow dish, cover with plastic wrap and place in the refridegerator for 4 hours, until solid. Place the beaten egg in a dish and the Panko/breadcrumbs in another dish. Form the croquettes into 2-inch long rounded cylinders. Dip each croquette in the Panko, then cover in egg, then again in the Panko. 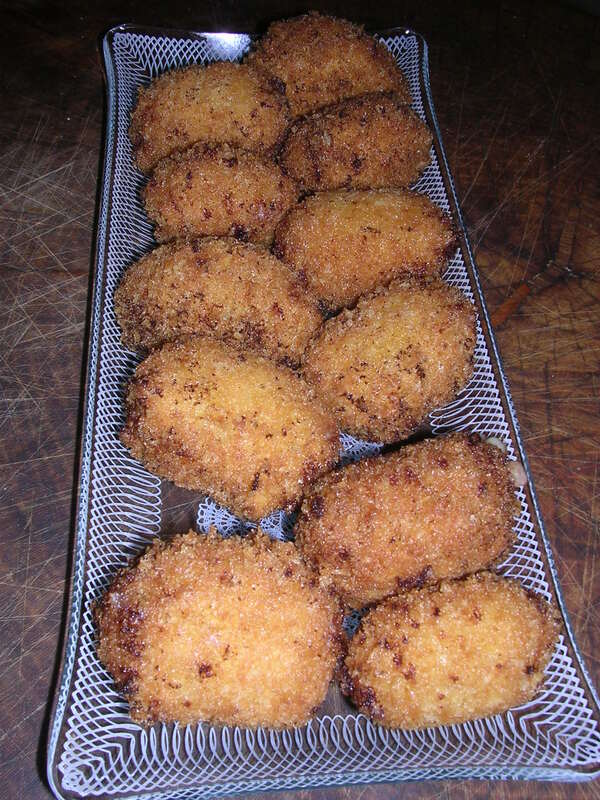 Make sure to cover the croquette thoroughly with Panko so that the insides of the croquette don't seep through. Transfer to a plate and place in the refridgerator for 30 minutes to dry. Heat oil in a deep fryer (or a saucepan with at least 3-4 inches of oil) to 365 degrees. Fry, about 3 croquettes at a time, until golden, about 3 minutes. With each batch, make sure to pick out/strain the brown bits and scraps from the oil. Also, before each batch, make sure the oil is back up to 365. To keep the croquettes warm, place on a baking sheet and set in the oven at about 200 degrees.